San Francisco/Golden Gate is a star article! It is a high-quality article complete with maps, photos, and great information. The Golden Gate area is in the northern section of San Francisco. 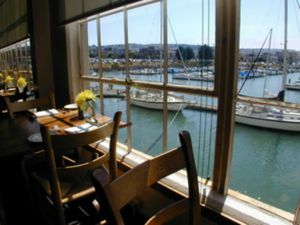 It is made up of two National Historic Landmarks — The Presidio and Fort Mason — as well as several upscale neighborhoods including Pacific Heights, Cow Hollow, and the Marina District. It has some of the most beautiful scenery and intact natural environments in the city. It is roughly bounded by the San Francisco Bay to the north and west, Lake St and California St to the south, and Van Ness Ave to the east. The Golden Gate Bridge connects this district with Marin County across the Bay to the north. Pacific Heights, located 370 feet above sea-level and overlooking the Bay, was little more than a sandy hill until 1870, when the Cable Car line was extended and connected the area to downtown. Today, it's favored by visitors for its impressive panoramic views of the San Francisco Bay and the Presidio, its abundance of opulent Victorian mansions, historic chateaus, foreign consulates, and finally its many upscale restaurants. The three blocks on Broadway St between Lyon St and Divisadero St have particularly good vistas and are known as the "Gold Coast." Some of the buildings date back as far as 1853, with the majority being constructed after the 1906 earthquake. Considered today to be the home of "old money" families and young urban professionals, it was first settled by the "nouveau riche" of the late 1800s. The neighborhood is predominantly peaceful and residential with most of its activities centered around Fillmore St. It was also the backdrop for the 1990 movie "Pacific Heights" starring Melanie Griffith. Cow Hollow derived its name from the many dairy farms that were established there in the mid-1800s. However, with the advent of the Gold Rush, the neighborhood flourished. Prominent San Franciscans began to settle the area and erected grandiose well-appointed Victorian, and then later Edwardian mansions. By 1891, the area had become so popular that all the dairy farms were closed down. Today, this once luscious grazing land is more renowned for its impressive mansions and its eclectic mix of antique stores, art galleries, bars, and restaurants. Union St is the main drag, where the Union St. Festival is held annually. The Marina district was built on landfill — some of it wreckage of the 1906 earthquake — in the early 20th century to provide a fairgrounds for the 1915 World's Fair (also called the Panama-Pacific Exhibition). Its poor foundation made it the focus of most of the damage (and media attention) in the Loma Prieta Earthquake of 1989. Today it is an affluent, residential neighborhood with well trimmed hedges and colorful flower window boxes. Bounded by the Bay, the neighborhood actually has an impressive marina, which is home to a couple of prestigious yacht clubs. Marina Green, an 8 block stretch of grass running along the edge of the bay, is a favorite place for jogging, strolling, picnicking, and kite flying. Only a few blocks away, Chestnut St. is where shoppers can peruse boutiques or people watch while sipping on a latte. 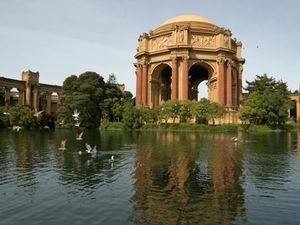 "Culture vultures" circle round Fort Mason, with its array of museums, art galleries and quirky theaters. Fort Mason and the Presidio are two former military posts on the northern tip of the San Francisco peninsula. Today, both are national historic landmarks and come under the remit of the Golden Gate National Recreational Area. Fort Mason is smaller and has a world class youth hostel as well as several museums and theaters. The Presidio is huge, with 1,480 acres of rolling hills, forests, hiking trails, historic buildings, architecture, beaches, and marsh lands. It has one of the most intact natural environments you will find on the peninsula and is a must for every itinerary. The main entryways are Van Ness Ave from the south and Bay St from the east. From the north and west, take Highway 101 through the Presidio to Lombard St. Chestnut St, one of the main shopping and restaurant streets, is one block north of Lombard St — parking is scarce and can sometimes take up to an hour to find. The best choice for parking may be the free area in Fort Mason, at Beach and Buchanan Sts, another 4 short blocks north of Chestnut. Union St, being Cow Hollow's main street, is three blocks south of Lombard St.
Public transportation, provided by MUNI , is plentiful and frequent. Cross town routes. The 28 bus gets you along Lombard St into Fort Mason from the Daly City BART station, traveling first a long way up 19th Ave and through the Presidio by the Golden Gate Bridge. Buses 29 and 43 traverse much of the western part of San Francisco before terminating in the area, with the 29 stopping in the Presidio and the 43 running through the Presidio before stopping in the Marina district. The 22 Fillmore bus (24-hour service) from the 16th St BART Station goes north on Fillmore St all the way to the Marina Green. From downtown. From the Caltrain station, traveling through downtown past the Montgomery St BART station (outbound) or the Powell St BART station (inbound), the 30 Stockton bus (which runs about every 6 minutes during the day, until 1AM) gets you to Chestnut St and near the Palace of Fine Arts. You can also take the 41, 45 (both serve Union St), 76, and 12. Routes 1, 2, 3, and 4 serve Pacific Heights and Lower Pacific Heights. In addition to the many MUNI routes, there is also the free PresidiGo shuttle service with two lines: a Downtown line  that runs directly between the Transbay Terminal in downtown to the Presidio, and an Around the Park line  which runs throughout the Presidio. If you enjoy walking, you can take the Historic F-line streetcar from downtown along the Embarcadero to Fisherman's Wharf, and walk along San Francisco Bay past Fort Mason — it's a bit of hill — to the Marina Green. If you're downtown, simply follow Van Ness Ave all the way north and take a left anywhere from California St to Lombard St.
With six lanes, going east-west, Lombard St is the main road and considered (along with north-south Van Ness) to be part of Highway 101. The winding section of Lombard St is due east, on Russian Hill. This is a fantastic area to either walk or cycle through as it is predominantly flat (with the obvious exception of Pacific Heights), and also because it's a very safe area. Given the area's popularity with joggers, walkers, power-walkers, and cyclists, you will definitely not be alone. Chestnut St is the business section of the Marina and considered among the poshest of San Francisco's streets. Union St and Fillmore St are the other two main shopping areas in this district. 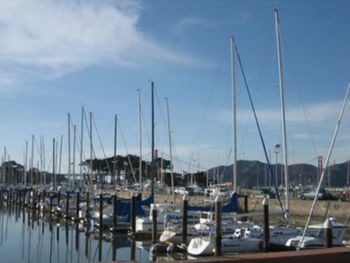 To the north, along San Francisco Bay, runs the 74 acre stretch of Marina Green. Your walk can continue along the bay to the west, through the Presidio, along the restored Crissy Field marshes, all the way to the Golden Gate Bridge; or to the east, a short climb through Fort Mason and down into Fisherman's Wharf. If you are interested in biking around the area — "biking the bridge" is very popular activity — there are several companies that rent bikes out to tourists by the hour or for the day, including Bay City Bike , Bike and Roll , and Blazing Saddles Bike Rentals . 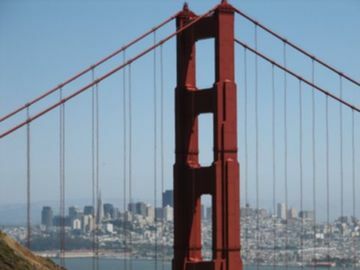 There are lots of things to see in this district ranging from the pristine natural landscapes of the Presidio, to man-made marinas, Victorian architecture, and the Golden Gate Bridge. In places like the Presidio and Fort Mason you'll find an interesting blend of both, with modern offices, historical buildings, and museums making their home alongside sandpipers, coyotes, and fox squirrel. "City slickers" should be more at home futher inland where they'll find galleries and museums, architecture, and urban parks. Naturalists will be more at home along the coast line, from Fort Mason all the way along into the Presidio. Architecture buffs will definitely enjoy taking a stroll through the Pacific Heights and Cow Hollow neighborhoods, where ornate (and huge!) Edwardian and Victorian mansions are on display. Many are privately owned so be respectful, but some are open to the public. If you are a fan of the Spanish Colonial Revival-style, continue your tour through The Presidio section below where you will find many fine examples. The Presidio ( and ) was founded in 1776 and was the longest-running military post in the U.S. before closing as a base in 1994. 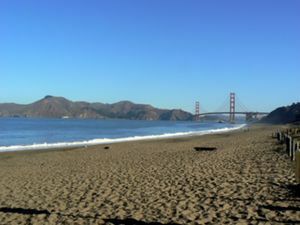 It is now a part of the Golden Gate National Recreation Area  and Congress has designated it a National Historic Landmark District, which is the highest historic designation that can be given in the U.S. The park itself is a beautiful 3 square miles of mostly hilly and wooded areas. 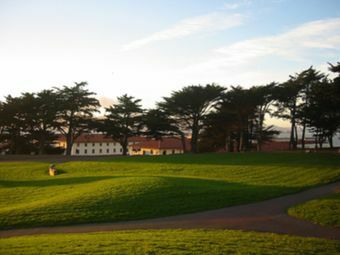 The Presidio has around 800 buildings within its perimeter, many of which are of historical significance. Some of the buildings have residential tenants, others commercial ones. 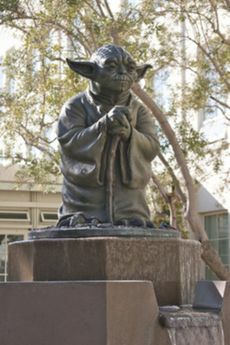 At the end of 2005, about 2,500 people lived in the Presidio and it is home to the headquarters of Lucasfilm (owned by George Lucas, the creator of "Star Wars"), a unique situation for a national park. Part of their drinking water comes from Lobos Creek (Rio de los Lobos), the last free-flowing creek in San Francisco. The Presidio Trust, that manages the majority of the park, is currently renovating the remainder of the buildings, with a view to increasing its list of residents to 5,000. 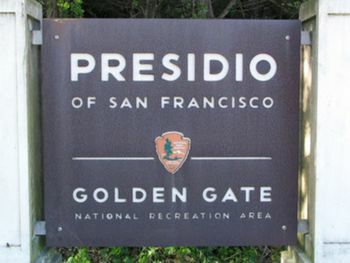 The Presidio contains 11 miles of hiking trails, including the Golden Gate Promenade, the Coastal Trail, an ecology trail, and portions of the Bay Area Ridge Trail, the Bay Trail, and the Anza National Historic Trail. Cyclists can explore the area on 14 miles of paved roads and along some unpaved parts of the Bay Area Ridge Trail. 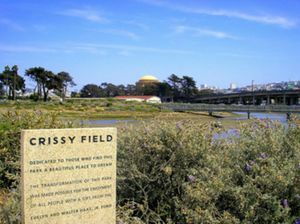 A world-class board-sailing area borders Crissy Field, while fishing and crabbing opportunities abound from the nearby rocks and pier. Along the way there are also many historical and architectural points of interest as well as some fantastic vistas and natural scenery. Nature lovers will adore the Presidio. Its geology, climate, and geography — combined with the Army's decision not to overdevelop the Park — mean that it has some of the most intact natural habitats on the San Francisco peninsula. It is home to many rare species of flowers including Raven's manzanita and Franciscan thistle as well as mammals like the coyote, gray fox, and the Fox Squirrel. Bird lovers will be pleased to know that there are a great variety of birds milling about including Gulls, Sandpipers, Plovers, Ducks, Herons, Loons, Pelecans, and Kingfishers . "Dedicated to those who find this park a beautiful place to dream"
In total, the bridge is 8,981 feet across (its main span being 4,200 feet). At its tallest point it is 746 feet, but only 90 feet across — 6 reversible traffic lanes and two walkways. The strait that passes beneath the bridge runs 400 feet deep. It is famously "over-engineered" — being over four times stronger than it needs to be. It took over four years to build and cost over $35 million. Amazingly, it has over 1.2 million rivets. Each of its twin towers weighs more than 44,000 tons and the total weight of the bridge is almost 900,000 tons. It is the second largest suspension bridge in the US and if you untangled all of its cables they would stretch around the world 3 times. It has been featured in many movies, including "Vertigo" and "Superman." US 101 (from Park-Presidio or Lombard St entrance), ☎ +1 415 921-5858 ([email protected]), . Open 24 hours, occasionally closed Sunday morning for events. $6 (toll driving south into San Francisco; free on foot or bike). Vehicular traffic in both directions share a single deck; yellow pylons are used to allot lanes to one direction or the other depending on traffic conditions. Observation areas and parking lots are provided on both the north and south sides of the bridge; the best way to enjoy the bridge is to park and walk across, not least because you don't have to pay a toll. Note that winds are high and it can be cold and foggy; dress appropriately. Bikes can also be difficult to navigate in the high winds and narrow pathway. The Golden Gate Bridge is one of the most iconic bridges in the United States, and has been called one of the Seven Wonders of the Modern World. The bridge spans the Golden Gate, a strait between San Francisco and Marin County to the north, and is one of the major road routes into and out of the city. The masterwork of architect Joseph B. Strauss, whose statue graces the southern observation deck, the bridge took four years to build, and was completed on May 27, 1937. Not actually golden in color — a common misconception — the bridge is painted a deep red-orange color known as "International Orange," also known as "Orange Vermillion." The color was specifically chosen to make the bridge more easily visible through the thick fog that frequently shrouds the bridge. Erroneous legend has it that the bridge is continuously painted, with crews starting at one end and, on getting to the other end, turning around and starting over again. In fact, the bridge is only painted once every few years, but touch up work is done continuously by a team of 40 painters. The San Francisco end of the bridge is accessible by the Muni 28 bus line from Fort Mason in the Marina District near Fisherman's Wharf. The fastest way to reach it from downtown is to take the 38 or 38L up Geary to “Park Presidio” (after 12th Ave) and transfer to a Fort Mason bound 28. Golden Gate Transit buses serve the bridge on request, but buses are very infrequent and unpredictable except at afternoon commute times, when they are crowded. Due to the "outdoorsy" nature of the area, many of the activities here are centered around nature, exercise, and recreation. If you feel like catching a show, there are also many theaters here of all descriptions. The three main shopping thoroughfares are Union St (Cow Hollow), Fillmore St (Pacific Heights) and Chestnut St (The Marina). Most stores here are of the small specialist boutique varitey — a mix of unique and trendy chain shops reflecting the upscale nature of the neighborhoods. Union St is unquestionably one of the best streets in the city to window shop on (and hey, that costs nothing! ), so take a slow stroll down Union St and enjoy the vibrancy and atmosphere of the shops, galleries, eateries, cafes and passers-by. With a friendly neighborhood feel, Fillmore St displays its charm through eclectic Victorian buildings that the stores are housed in. The street has a relaxed vibe, shopping here is a leisurely activity — many stores don't open until 11AM, some are closed on Mondays and most are closed on holidays. Chestnut St in the Marina is the one-stop street for anything you could need. Word to the wise — watch out for all the double-wide and double-decker baby strollers... they'll run you down. There is an excellent selection of restaurants in this area; everything from regional Chinese restaurants to Tapas bars, and from Japanese sushi houses to American steakhouses, romantic French bistros, and Italian restaurants. A lot of the food plated here is of the healthier variety — a reflection of the heightened overall health consciousness of residents in this area. Therefore, many of the restaurants serve up food that's organic, vegetarian, or produced from locally sourced ingredients... is there any other way!? Like most other businesses in the area, most restaurants are on Chestnut St, Union St, and Fillmore St; or indeed, one of the side streets leading off them. 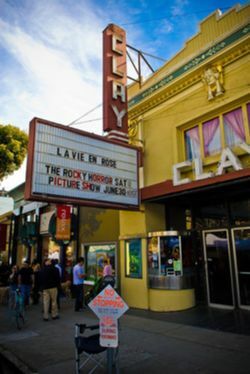 The area is not particularly well known for its cutting edge nightlife; it's more residential vis-à-vis downtown, and it does not have the cool cachet of trendy hotspot SoMa, nor the hipster popularity of North Beach and The Mission. So, if you're looking for a progressive clubbing scene, you probably won't find it here. What the area does offer though is many upscale bars, wine bars, sleek lounges, and clubs. The scene here can be pricey and many people deliberately avoid the bars and clubs here feeling that they are too pretentious, and consequently sterile. However, this can be a mistake as there are also plenty of cheaper options where you can get equally raucous and debaucherous on your nights out... thank God for that! This area has a great "cafe culture," with lots of good Americana-style cafes. It's a great place to sit down and unwind at a curbside table, sipping away on latte, after a hard day trekking around. Not listed here are the more ubiquitous coffee chains like Starbucks, The Coffee Bean and Tea Leaf, and Peet's Coffee; although these are very well represented here too, particularly along Union St, Chestnut St, and Fillmore St. The neighborhoods in this district are really just that — neighborhoods; as such, you won't find many of the larger luxury chain-hotels here. 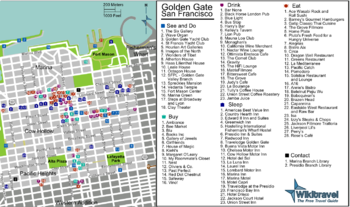 Many of the areas accommodations are located on Lombard St, which runs east from Russian Hill to the Presidio in the West, and actually forms an informal boundary between the Marina and Cow Hollow. Most of the accommodations along Lombard range from run down motor lodges to slightly more respectable bed and breakfasts. Thankfully, as the area is not as congested as downtown, many of the hotels/motels offer free parking. Golden Gate Park — If you're a fan of either Fort Mason or the Presidio, why not continue your tour into the enormous Golden Gate Park, where you'll find many more museums set in a natural park environment. Fisherman's Wharf — If you like everything nautical and would like some more, you should check out the flotilla of fishing vessels at the Wharf. This page was last edited on 3 March 2019, at 12:39.